SMS Alex Kidd: The Lost Stars (USA/Europe) in 20:17.28 by The8bitbeast. Alex Kidd: The Lost Stars is the second game of the Alex Kidd series, and by far the most simplistic. 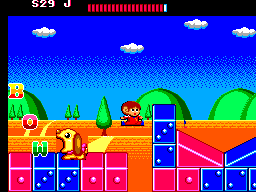 The game features Alex Kidd, with much less abilities this time around, mostly running and jumping through levels. However, the game features voice acting. This run by The8bitbeast beats the game collecting all twelve Miracle Balls in a little over 20 minutes.